As show season gathers momentum, Barbara Collins takes a look at the increasingly popular food and drink hub at Balmoral Show. As with many mainline agricultural shows, farm-produced food and drink is always warmly received. 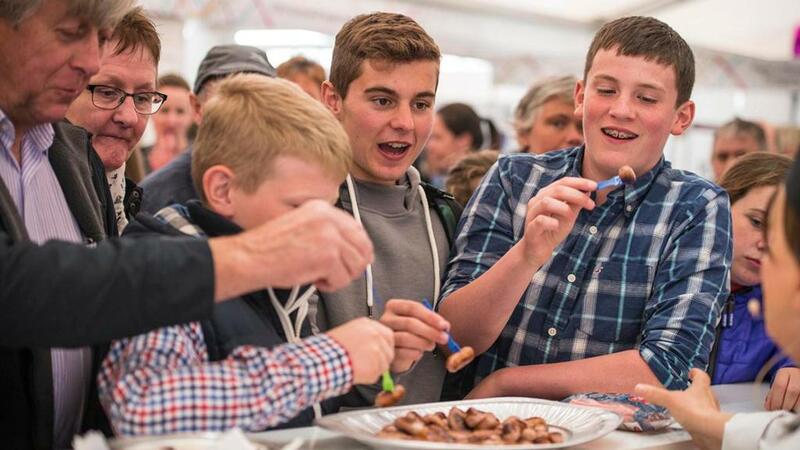 This year, Balmoral Show took place over four days instead of the traditional three, from Wednesday, April 10 to Saturday, April 13, to encourage more visitors from a non-farming background and allow families to come without missing school. 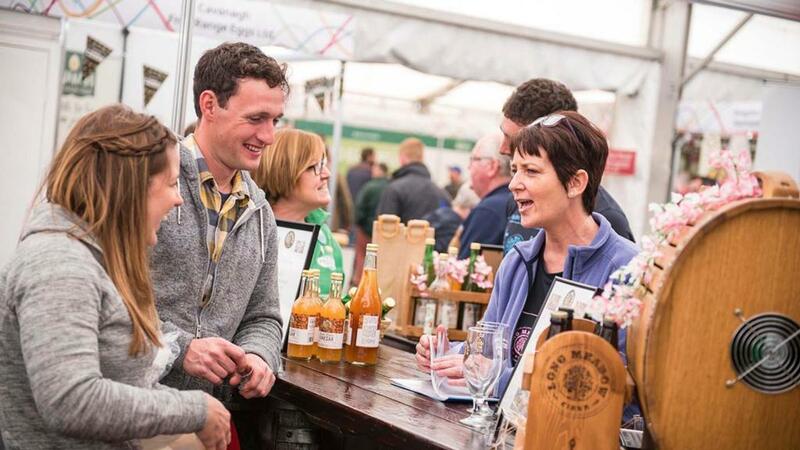 With an average of 25,000 people attending each day, the show provided a huge audience for Northern Ireland’s agri-food producers and the food and drink hub did not disappoint, returning bigger than ever. What started eight years ago with six producers, the NI Food Pavilion has now grown to more than 90 showcasing a wealth of diversification businesses. Most are members of Food NI, which is a not-for-profit organisation showcasing Northern Ireland’s food and drink. The marquee is always thronged with people, especially at lunchtime. Samples on offer range from Armagh apple juice and cider, Moy Park chicken nuggets, coleslaw, chorizo, crisps, cheese, rapeseed oil, balsamic vinegar, chocolate and yoghurt. Street food on offer includes Dexter beef burgers, potato and apple griddle bread, scones and cupcakes. Chief executive Michele Shirlow says Balmoral is the biggest event of the year for Northern Ireland. “Visitors to our pavilion had the opportunity to meet and talk to our producers, to sample their products and purchase the very best of our food and drink,” she says. 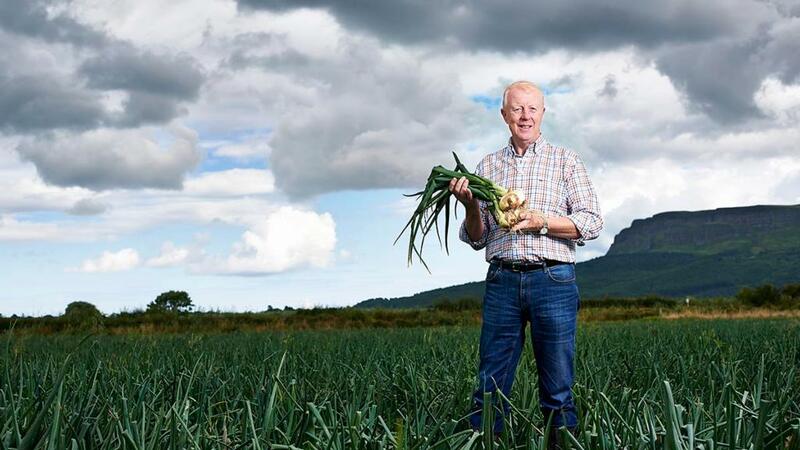 “Our work at Food NI is to align and showcase our producers on a world-class platform. For the past two years, judges from the UK Guild of Food Writers have travelled over to pick Food Award winners from the stands in the pavilion. The food writers chose Weir’s Organic Raw Milk as the Best Product in Show run by dairy farmer Deane Weir. “This is just the second year I have been at Balmoral. I was only there for one day and it was fantastic to get that recognition from the judges for our product. I couldn’t be more thankful.” Back on his 28-hectare (70-acre) farm, Deane has a small dairy herd of 20 cows comprising British Friesian, Jersey/Shorthorn crosses and Ayrshires. Although he has always held onto at least one cow since the farm was handed over to him by his father in the late 1990s, he has worked at a diverse range of jobs and farmed part-time. “I drove a mobile library van fulltime when I started the organic milk in 2015. I had always farmed and milked cows, but I hated big numbers. “Twenty years ago there was this mindset that you had to get bigger or get out of farming. People were running up a lot of debt with loans and bank charges and that wasn’t for me. I got rid of the milk quota and most of the cows and went small scale,” he says. Deane started producing organic raw milk three years ago and his investment consisted of a stainless steel table and a stainless steel jug. “That is my bottling plant and it works very well. You just have to make sure everything is sterile.” The New Zealand Nu Pulse milking system had been installed in 2006 at a cost of about £6,500. “I decided to live the dream and spend more time with the family at home. My wife Kerry and I have three children. Samuel is 14. Hannah is 12 and Seth is nine. “The biggest challenge at the start was keeping the Food Safety Authority happy. There was so much testing to do. I understand that though, it has to be a safe product. “The other big challenge is that I am not allowed to sell raw milk in shops. I can sell from the farmgate, at farmers’ markets and on a milk run, which I did this morning.” Selling about 110 litres on the run from his home to Lurgan, Lisburn and back again, the milk is sold for £1 a litre. “People are getting clued up on proper food. So many people who came to the stand at Balmoral were asking about the health benefits. It’s about the presence, giving out samples and chatting to people. Obviously winning the prize was great, but I just enjoyed being out for the day. Thousands of samples of award-winning blue cheese were handed out from the Kearney Blue stall in the pavilion. First made by former civil servant Paul McLean at his home on the Ards Peninsula, it won Best Irish at Nantwich International Cheese Show in 2011 with his second make. 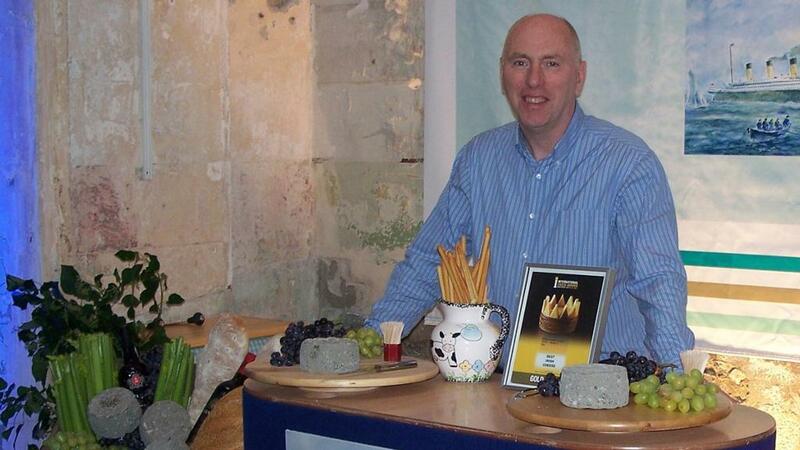 Made to resemble the dry-stone walls of his townland of Kearney, it quickly became one of the most talked-about cheeses in Northern Ireland and has won three stars at the Great Taste Awards. Demand far outweighed supply, so Paul decided to move to a purpose-built production plant at Farmview Dairies in the Castlereagh Hills outside Belfast. He says: “I have always used Farmview Dairies milk in my cheese because the quality is outstanding. “Having the facility at their plant means we can supply hotels and restaurants across the island. A lot of our trade is actually with Dublin hotels and restaurants” says Paul. General manager of Farmview Dairies David McCracken says Balmoral Show is an important one to attend. “It’s about being seen there. Sales are always healthy but it’s more about meeting the public, the buyers, and the chefs. We have been coming here for years as you really can’t miss it. It is part of the fabric of the Northern Ireland agri-food scene and it always will be. It definitely generates business.” This year, celebrity chef Jean-Christophe Novelli used some of the cheese in a breakfast dish he was cooking on stage at the Taste the Greatness demo kitchen, a show highlight for Paul. Ian Miller’s family own a farm at the foot of the Binevenagh Mountain on the outskirts of Limavady. They have been growing and packing brown onions commercially since 1989 and also produce red onions, garlic and shallots. Ian has created one of Northern Ireland’s favourite accompaniments to a steak dinner in the form of crispy onions. Their stall at Balmoral is always popular, with people eager to sample a handful of the savoury snack. “It is always good to get feedback from customers,” says Ian, who supplies Tesco, Sainsbury’s, Asda, Co-op and Spar. “We do sell our onions at a special show price of £1 a box, although really it is more about getting to talk to customers because you don’t often get to do that during the year.